Ginny is the daughter of Brent and Sally Arnold, and sister to Walt and Tessa. She is a sophomore at Coleman High School where she has been involved in cheerleading, basketball, track, and softball. Last year academically she was high point girl of the Freshman class. Ginny has participated in the Coleman County Cowgirls organization since she was in the 6th grade, helping to represent the Coleman Rodeo Assoc. in the Western Heritage parade, as well as every Coleman Rodeo parade since that time. 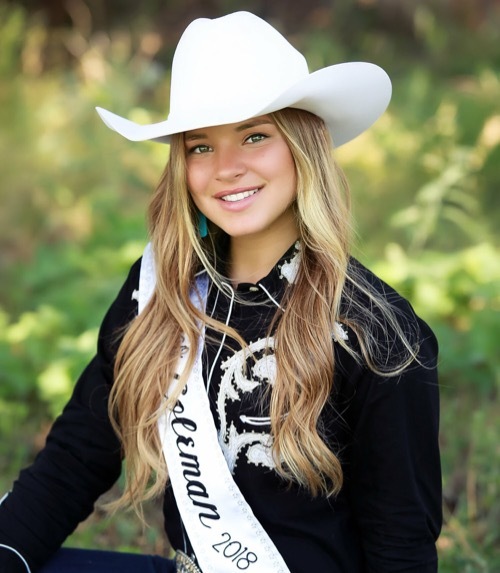 Last year she competed in the west Texas Region II, of the Texas High School Rodeo Association in the barrel racing, and also competes at various rodeos and jackpots.